In a perfect world I would be posting an updated Q&A with Jean Moss today to coincide with her blog tour, but I’ve been swamped with non-craft related work and have barely had time to brush my hair let alone type up interview questions. It’s disappointing that I haven’t been able to devote more time to my blog lately, but I’m hoping that directing you to my previous podcast interview with Jean will alleviate some of our collective disappointment about this and give you a chance to hear her story if you haven’t already. Clearly Jean has been very busy lately, too. 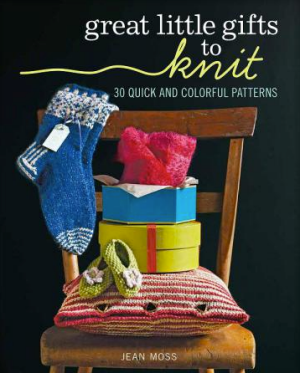 Her new book, “Great Little Gifts to Knit: 30 Quick and Colorful Patterns,”(144 pages, $21.95) is out and and there are several projects inside that are making me wish once again for the ability to freeze time so I can just sit by the fire and knit a few of Jean’s fun patterns. 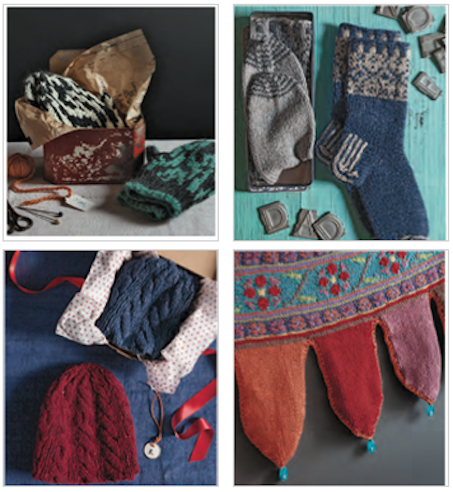 The book includes an interesting range of patterns for babies, kids, men, women and the home, making it a great gift for the knitters in your life who like to stitch handmade gifts.